Malcolm Salt, owner of Pukekohe Mini Diggers, was born and bred in East Tamaki, where his family once farmed. He now lives on a large section in Tuakau, 30 minutes south of Auckland with his wife Josie and daughters Briar and Renee. Malcolm specialises in trenching, drilling holes, drainage, footings, garage sites and working in confined work spaces. Prior to starting his business in 2003, Malcolm worked on a variety of projects, on a range of diggers and for a number of companies. 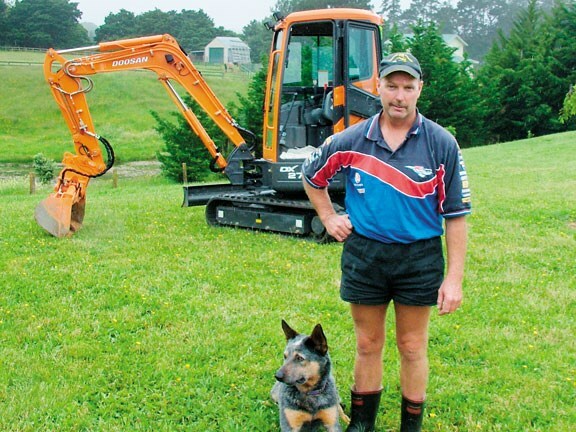 Malcolm’s confidence as an operator had grown to such a degree that he and Josie decided to start up Pukekohe Mini Diggers. 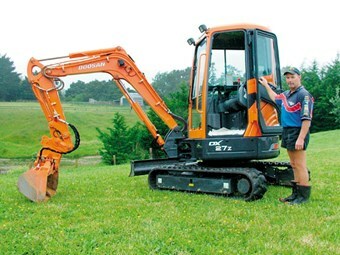 After two years’ in operation, Malcolm bought a Doosan 1.8. It was the first time he had dealt with Doosan, and found the service to be superior to anything he’d experienced. "The guys at Doosan were really helpful and stood by me whenever there was a problem." 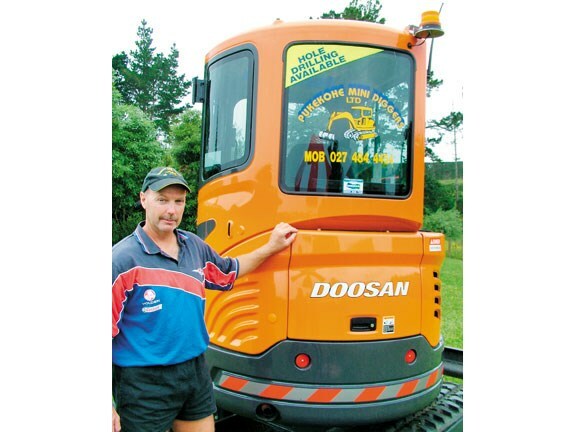 As demand for bigger jobs grew, Malcolm upgraded to a Doosan DX 27, which he’s currently still operating. "The 2.7 has opened up many doors. I can now carry out bigger jobs and more variety. I still do the smaller jobs, but hire a smaller digger for these. "It’s a really good digger; I’m really rapt with it." Malcolm says the Doosan DX 27 has some outstanding features including operator comfort. "The controls are a lot smoother and the layout of the cab is great with good visibility." Malcolm has also found the zero tail swing to be a huge advantage. "I can dig right up against a wall and spin around without hitting it, while having the power of a larger digger." Having more power has also allowed Malcolm to take on bigger jobs with ease and confidence. "It’s got really good digging force compared to others I’ve used and the buckets are a lot bigger so I can load a good sized truck. It can handle tasks that the smaller one couldn’t." Easy access to the service compartments has also made life easier for Malcolm, who likes to carry out all his own maintenance. "I always have a rule that if something is broken I fix it straight away. I do most of the maintenance on my digger and truck but I let Doosan do the first service on the digger." One of the biggest surprises for Malcolm was the fuel efficiency of the DX 27. "It’s more powerful and can do a greater variety of work than the smaller one, but it’s more economical." To compliment the digger, Malcolm has also purchased a number of quality attachments from BAS to ensure he can carry out almost any task put before him. Josie describes Malcolm’s workload as "picking up a lot of the tid bits and left overs that no one else caters for". These "tid bits" have seen Malcolm work on some interesting projects, including digging 8km of trenches on the new motorway at Mangatawhiri, through Wayne Penu of Xcavation Specialists Ltd, constructing an amphitheatre at St Cuthbert’s College, digging foundations for Ideal Garages, loading a skip on a 100-tonne crane at the Hobson Bay tunnel at Okahu bay and working for Shannon Philcox of Powerhouse Civil Ltd on Vector projects. Malcolm says having a smaller digger means he’s very versatile and manoeuvrable. He recalls working on a swimming pool in the backyard of a North Shore mansion. The house was on a cliff face, so his only access was through the front door. Other jobs, he says, have seen the digger craned over buildings to get to the worksites. "The digger is small enough to get into these jobs, but big enough to save landscapers a lot of hardwork," he says. See a range of mini excavators for sale here. To read in-depth machinery reviews, see the latest issue of Farm Trader magazine, on sale now.